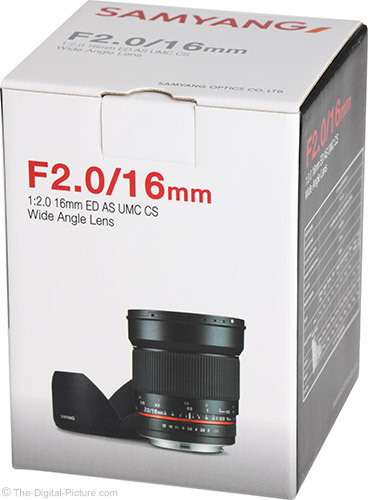 The Samyang 16mm f/2 ED AS UMC CS Lens hit the market claiming the widest aperture for any prime lens wider than 20mm. The Samyang hit the market as the overall widest aperture 16mm lens, but Tokina later dampened this claim with the release of their 14-20mm zoom lens also providing the same f/2 max aperture. Typical for Samyang is that the price of their prime is a strength and the image quality for the price makes their option an especially good value. 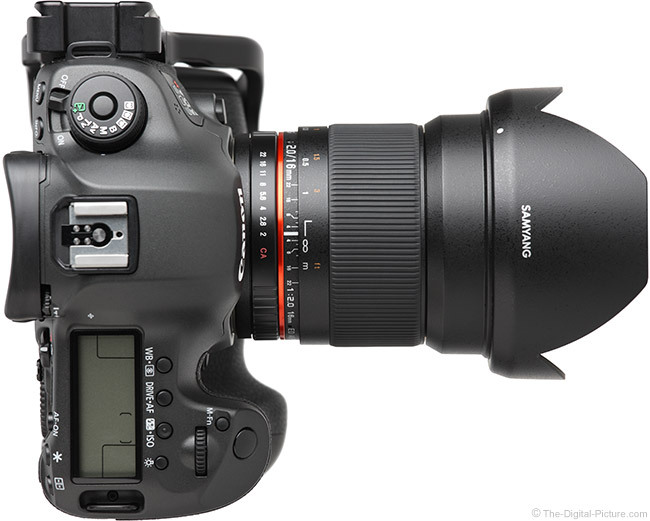 As of review time, all of Samyang's DSLR lenses are manual focus-only. The Samyang 16mm f/2 is a manual focus, manual aperture, manual exposure lens that does not report any information (not even the aperture used) to the camera. Note that Samyang used to make their lenses available in a variety of brands, but market demand led to only the top-selling Samyang and Rokinon-brand lenses remaining in its product lineup. Also note that chipped versions of this lens may become available, supporting some additional features including autoexposure and focus confirmation. These features potentially come with a slightly higher price tag. 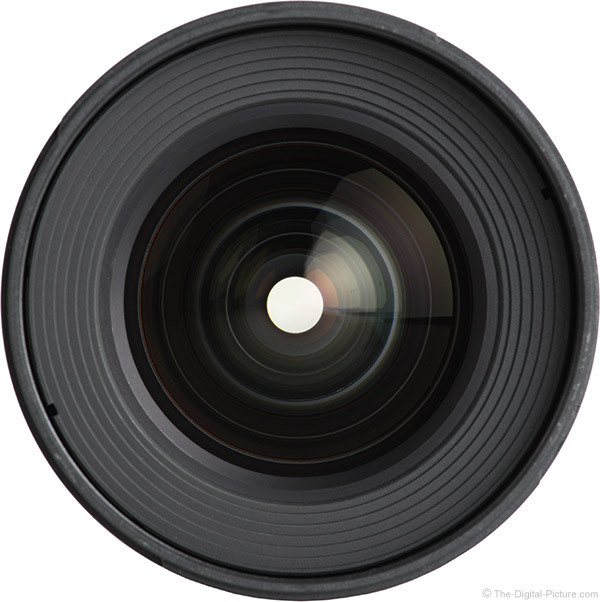 Important to know is that this lens is designed to provide an image circle large enough to cover only APS-C-sized (1.5/1.6x) imaging sensors. The astute among you will notice that the full frame 5Ds R is the camera model shown in all of the with-camera product images below. While this lens does actually work on a full frame camera (I'll discuss this), I apologize in advance for any confusion I cause by this – I didn't have an APS-C model available while producing these images. 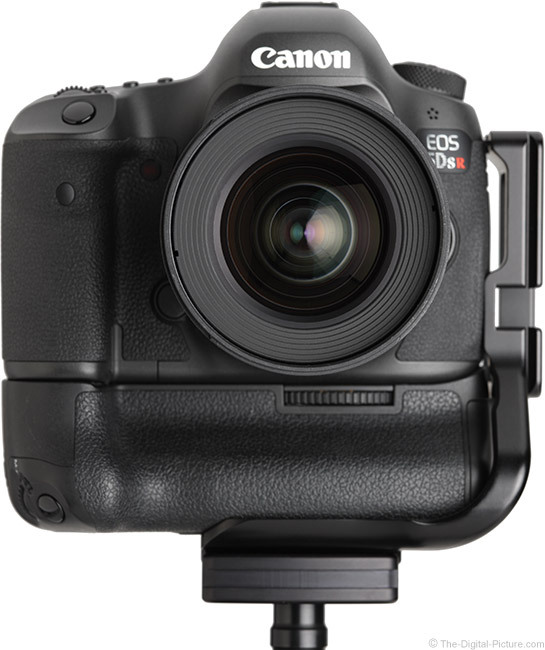 Pretend the camera is a similarly-sized EOS 7D Mark II. Just because a lens is made specifically for an APS-C body does not mean that its focal length is measured differently, somehow accounting for the smaller image circle utilized by the smaller imaging sensor. A 1.5x or 1.6x multiplier (FOVCF) must be used to determine the full frame angle of view equivalent that many of us think in. Multiplying 16mm by 1.6x yields 25.6mm, the full frame 35mm format camera angle of view equivalent for this lens. This angle of view is just slightly narrower than the ultra-popular 24mm focal length used on a full frame body and the uses for this lens are vast. Landscape photography is a great use for this lens. This focal length is quite wide and allows an entire scene to remain in focus, but it is not so wide that it complicates composition. A very high percentage of my landscape images have been captured with a similar angle of view. Architectural photography, large product photography, interior photography, birthday parties ... are some uses for this focal lengh. Wedding and event photographers often utilize a wide angle lens for capturing large scenes, for environmental-type portraits and for larger group portraits in tight spaces. Photojournalists' needs are often similar to those of a wedding photographer and can also make use of this focal length. When combined with an extreme wide aperture, this focal length is a great choice for night sky photography. Videographers will find a host of uses for this focal length and there are plenty of general purpose uses for it. As mentioned, this is a manual aperture lens. While the camera's autoexposure system can still be used, the aperture is *always* manually set via an aperture ring located near the lens mount. With the camera not able to automatically set the aperture, Tv (shutter priority) mode will function the same as full manual mode. You can change the shutter speed, but the aperture ring will also have to be manually turned to affect the final exposure. Note that the (unchipped) lens will not report the selected aperture to the camera and the aperture setting will not be recorded in the captured image's EXIF information. While the camera's autoexposure can be used, I found it to be quite inaccurate at stopped down apertures (overexposing). The site's standard vignetting results are captured utilizing Av mode and this brightness difference is readily apparent at f/8. Using manual exposure mode works very well (though using this mode becomes challenging if shooting under rapidly changing light conditions). The aperture adjustment is very easy (simply turn the aperture ring), but you need to know that click stops are in 1/2 stop increments. If you are used to making 1/3 stop adjustments in-camera (often the default), care must be taken to match manual exposure adjustments (shutter speed and ISO) to those made on the lens. Adjusting three clicks on the camera and three clicks with the ring is what my mind wants me to do. Note that there is one exception to the half stop aperture settings – the half stop between f/16 and f/22 is not available. Few will care about this missing half stop setting and stopping the ring in between the click stops is possible. The de-clicked aperture "cine" version of this lens will make more sense for those requiring higher aperture precision. 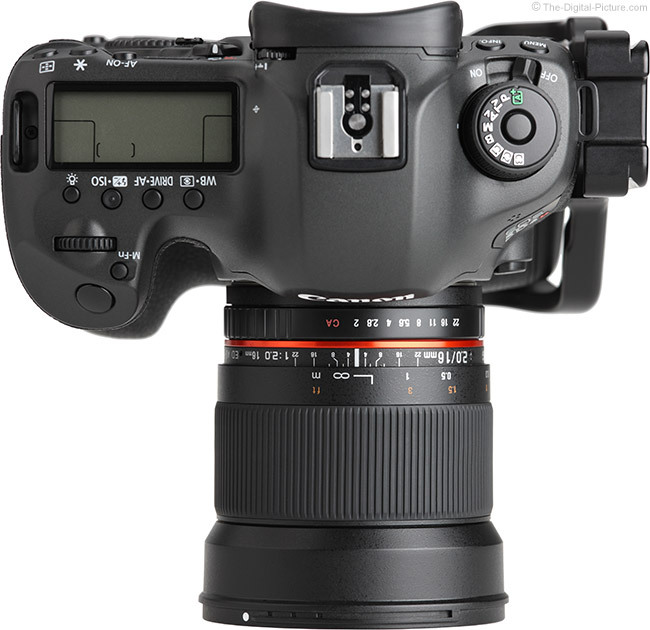 Depth of field preview is always enabled on the Samyang 16. With a manual aperture implementation physically closing down the aperture blades when the aperture ring is turned, the viewfinder (or Live View) is always showing the stopped down view (unless f/2 is selected of course). While seeing the actual depth of field at the selected aperture can be advantageous, a certain downside is the darkened viewfinder provided at narrow aperture settings. At f/2, the viewfinder is bright. At f/5.6, the viewfinder becomes noticeably darker and it continues to darken as the lens is stopped down further. My preference is to compose (for the brighter viewfinder) and focus (better precision with a shallower DOF) with the aperture set to f/2, then adjust the aperture to the desired setting prior to photographing. 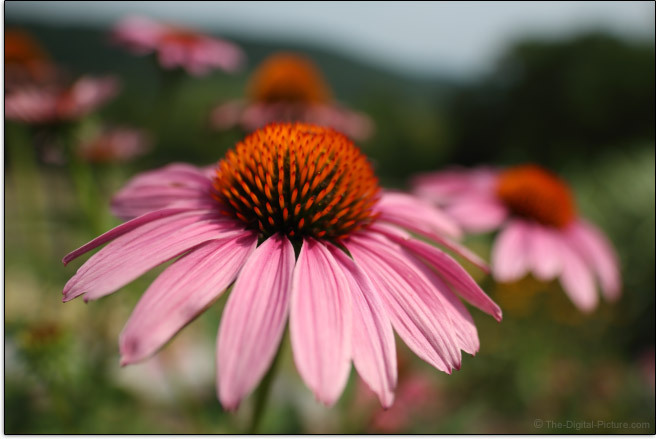 Here is an example showing the maximum background blur this lens can produce at f/2. This flower, positioned at this lens' closest focus distance, is about 3.5" (90mm) in diameter and the most distant mountain is close to 1 mile (1.6km) away. The Samyang 16mm f/2 lens is slightly soft at f/2, but rather evenly so across the entire frame. Stopping down to f/2.8 makes a significant improvement in sharpness, especially in the center of the frame. The center of the frame is very sharp at f/2.8 and even slightly sharper at f/4. You will not likely notice any center of the frame sharpness improvements made by stopping down further. For a wide angle, wide aperture lens, the corner performance at f/2 is rather good. The extreme corner of the frame sharpness increases gradually until reaching what I would call great at f/5.6. The improvements are largely in part to vignetting clearing, but I'll discuss that attribute soon. 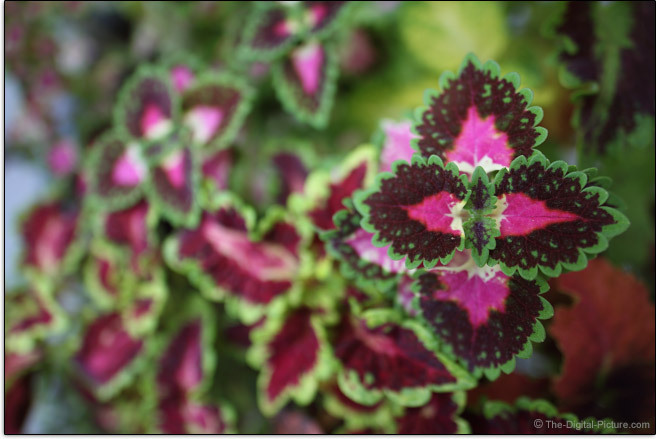 Following is a pair of comparisons showing 100% crops from an EOS 60D. These images were captured in raw format and processed in DPP using the Standard Picture Style with sharpness set to "2". I often use a "1" setting for such crops, but the 60D is by default tuned slightly softer than the current EOS DSLR models. Bumping up that setting by 1 equalizes the difference. The following examples are from the center of the frame. As expected, the f/2 results are slightly soft. 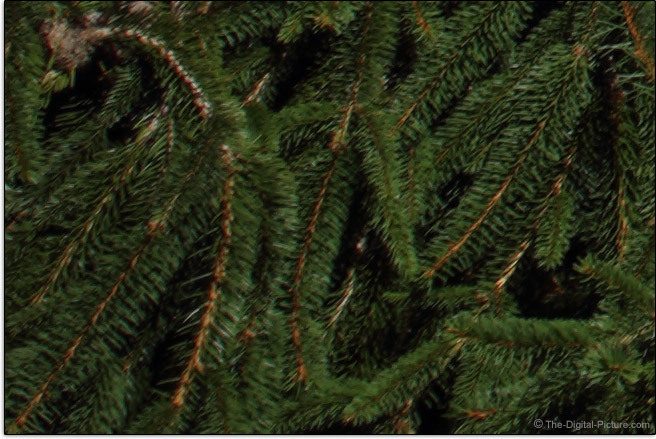 But, as shown in the "Sharpened" result set, the f/2 images respond nicely to sharpening. A very nice bump in contrast is seen at f/2.8 with f/4 bringing on some slight additional improvement. F/5.6 is not needed for a sharpness advantage. We returned our first copy of the Samyang 16 because the corners were not equally sharp, indicating a problem with the lens. The replacement lens performed much better in this regard, delivering equal sharpness in all corners. Here is a sample set taken from the extreme bottom left corner of the frame. As the aperture is narrowed, the brightness and contrast of the corners increases, almost linearly, through f/5.6 where the performance is excellent. Obviously, vignetting is affecting the corners and this is normal. 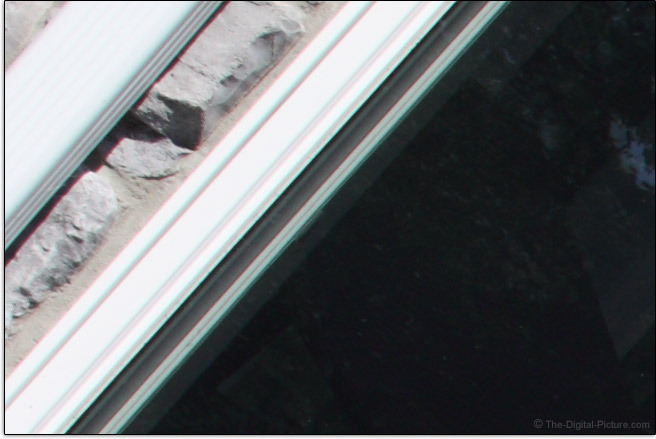 The corner shading is approximately 2 stops at f/2, an amount that is not especially strong. Roughly 1 stop remains at f/2.8 and 0.5 stops remain at f/4. The brightness evening of the corners slows signifcantly at f/5.6 and beyond, with a rarely noticed 0.3-0.2 stops remaining. While the mechanical vignetting is very strong in these samples, there is still a nice amount of useful image remaining here. Lateral (or transverse) CA is a rather common lens defect and one that is rather easy to find. Simply place a line of high contrast running meridional (tangential, right angles to radii) near the corners of the frame and look for colors separating. This lens shows a modest amount of latCA as seen in the extreme corner sample below. Especially with the correct lens profile available, latCA is easy to correct with little pixel-level destruction noticed. Not as easy to discern (or correct) is axial (longitudinal, bokeh) CA and spherical aberration along with spherochromatism. This lens has a small amount of these issues. The SA clears quickly with stopping down (creating a sharper image) with the axial CA remaining very slightly noticeable. Notice how the fringing color changes through the depth of field in this f/2 example. Put the sun (or other bright light source) in the frame and some flare should be expected. 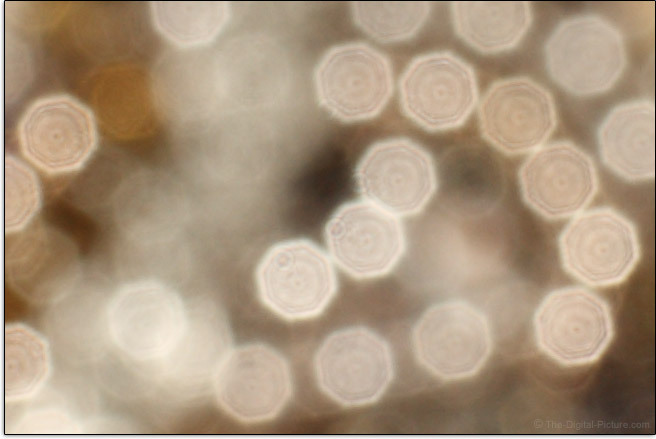 The effects are not bad at the wider apertures, but when stopped down significantly, they become quite prominent. Let's call them "artistic". A wide angle lens with an ultra-wide aperture invites night sky photography and coma is a lens defect that is easily identified when stars are the subject. Ideally, stars remain tiny, pin-point circles of light in a photo, but at least some amount of coma is present in most lenses, rendering the stars more like tiny comets or insects. In this regard, the Samyang 16 f/2 is one of the best performing lenses I've used. Though not terribly strong, this lens has some barrel distortion. 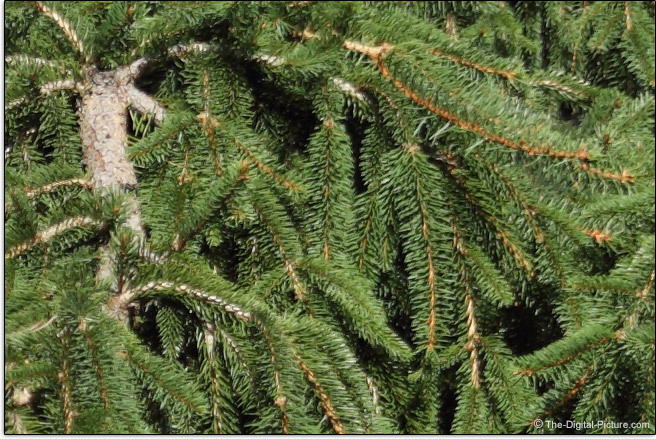 Following is a reduced-size crop showing the entire top of a frame. Notice how the lines curve toward and then away from the top edge. With the right lens profile available, linear distortion can easily be corrected. However, this is a somewhat-destructive process at the pixel level and the composition is adjusted slightly. With barrel distortion, the corners must be pushed out to match the mid-frame area. This means that portions of the image become stretched and/or the overall resolution is decreased. The centers of the OOF specular highlights are not smooth and the effect is somewhat harsh overall. I decided take to the Samyang 16mm f/2 Lens with me on a trail run one evening. I mounted it to a Canon EOS M3 via the EF Lens Adapter (note that there is also an EF-M mount version of this lens), put both in a Lowepro Toploader Pro case and went out at a quick pace, hoping to reach a high elevation field location by sunset. I arrived just prior to sunset, sat on the ground using my knees as a tripod, focused and pressed the shutter release. Nothing happened. The lens would simply not work on the M3. Baffled, I quickly went into troubleshooting mode, struggling to find something wrong. I finally determined the custom function "Shutter release without lens" had to be enabled for this lens to work. I found that solution just before the sun went over the horizon. The sunset was pretty, but quite mundane as far as sunsets go (clouds were very scarce) and missing this shot would not have left me very disappointed. But, not all situations are the same and having tested this combination before I left home would have been a much better idea. Experience can give us confidence, but it can also make us careless in our assumptions. Fortunately, experience can also make us resourceful enough to overcome problems encountered in the field. 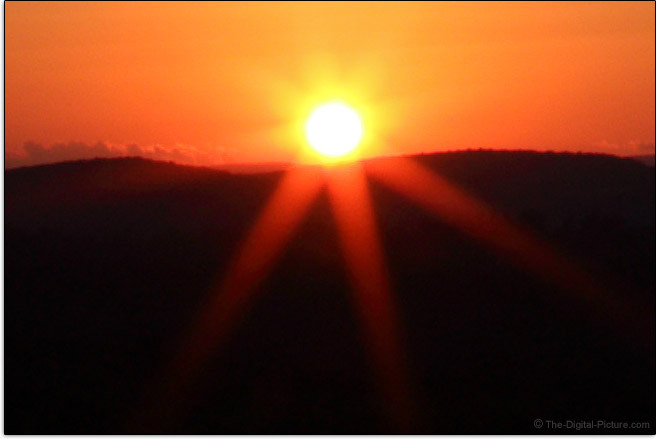 That was a long story, but ... the sunburst sample below was the result of this evening. The point behind sharing this 100% crop is to show the starburst effect created by this lens with the aperture stopped down (to f/16 in this case). 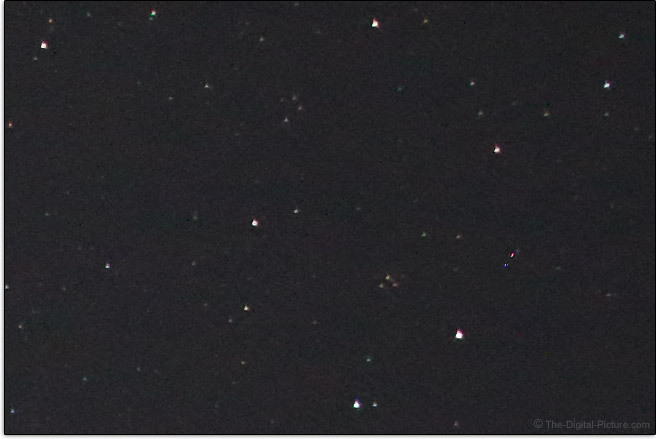 As you can see, the starburst has 8 points – equal to the even number of aperture blades in this lens. Overall, the Samyang 16mm f/2 Lens delivers very good image quality. Especially if stopped down to f/2.8, it is capable of delivering very high grade images. As with every other manual focus-only lens out there, the focus speed of this lens is ... completely dependent on how fast you can turn the manual focus ring. The rate that the focus ring affects distance change does come into play with manual focus speed, but ... most will not find that attribute to be a big deal in this regard. While MF-only simplifies a lens from a design and construction (and testing) standpoints, it limits the lens' usefulness for certain applications. While 16mm is relatively wide on an APS-C format camera, most will still find focusing this lens accurately using the viewfinder and stock focusing screen to be a challenge. The unchipped version of this lens (I am not finding chipped versions available as of review time) does not provide functionality for the DSLR's focus confirmation light, but I do not find DSLR focus confirmation lights to be accurate enough to count on for manual focusing anyway. Fully zoomed Live View manual focusing (10x, 16x, etc.) or the equivalent (such as using a tethered laptop) is the ideal way to focus this lens. Using a tripod is ideal for this focus method. Of primary importance in a MF-only lens is the manual focus ring. The Samyang 16mm f/2 Lens' MF ring features a very long, especially for the wide focal length, 152° of rotation, making very precise focusing easy. This lens is very easy to precisely focus at minimum focus distance and also at infinity. The focus ring is smooth with little play. It is lightly damped, which is not a big deal except that it is both raised slightly and positioned close to the aperture ring. Multiple times I inadvertently adjusted the focus ring when attempting to change the aperture ring. Focus distances are printed on the focus ring (in both ft and m) and a DOF scale covering f/4 through f/22 is provided. The MFD (Minimum Focus Distance) and most-infinite (past infinity focus usually) focusing distances are hard stops, making focus setting marks repeatable. Subjects change size only a small amount over the focus distance range. Samyang does not publish the MM (Maximum Magnification) spec for this lens, but ... it focuses very close. This lens' MFD (Minimum Focus Distance) is 7.9" (200mm). That distance is measured from the imaging plane and the lens and rest of the camera must fit within that distance. 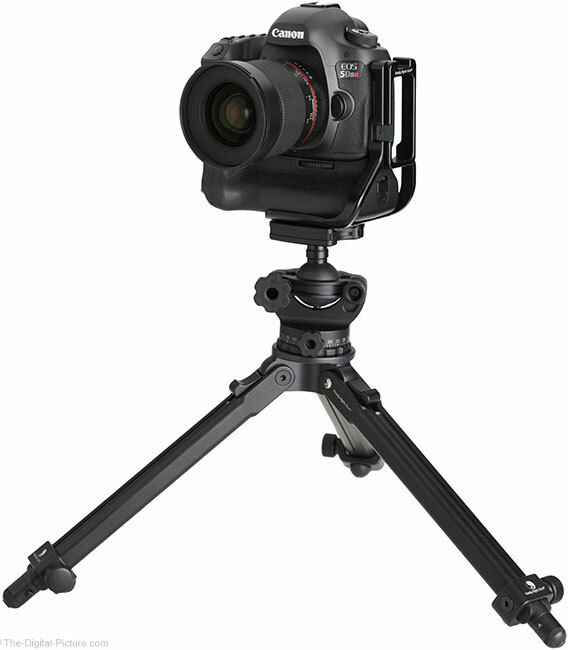 That means the working distance is very short – immediately in front of the lens hood if mounted. I usually provide a comparison table at this point in the review, showing how this lens' close focusing capabilities compare to similar lenses. However, there are very few comparable lenses available. Many lenses cover 16mm, but few are wider than f/2.8. I'll pick a small selection that I find interesting and will let you use the specification comparison tool to create your own comparisons. Notice the light fall-off to the right side? Shading the subject with the camera, lens and your body becomes an issue at this close focusing distance. Increasing the magnification of this lens via extension tubes is not going to happen. These will reduce the focus distance too much for focusing to be possible. The Samyang 16mm f/2 Lens is basic in appearance and very similar to the other Samyang lenses in many respects. This lens is fixed in size and has no buttons (none are needed). The exterior barrel parts are made of quality plastic, though I'm not as sure about the quality part applying to Samyang's aperture rings. These rings are also made of plastic and all have worked fine for me, but ... their feel doesn't exude confidence. The focus ring consumes a sizable portion of the lens barrel and much of the focus ring gets the standard ribbed-rubber cover treatment. 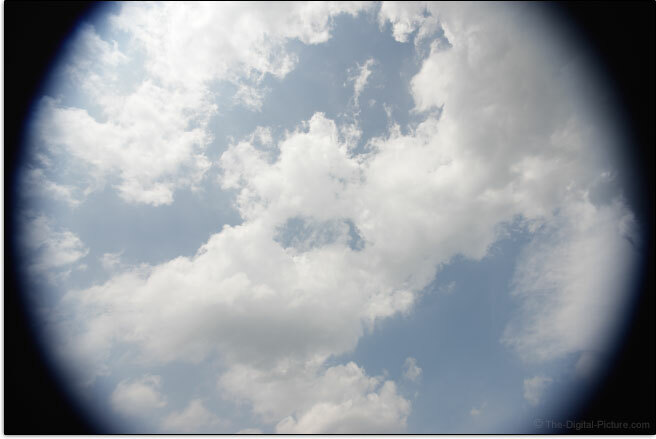 As discernable in the above image, this lens is missing a rear gasket seal and this lens is indeed not weather-sealed. Use a lens cover if wet or dusty conditions are possible. 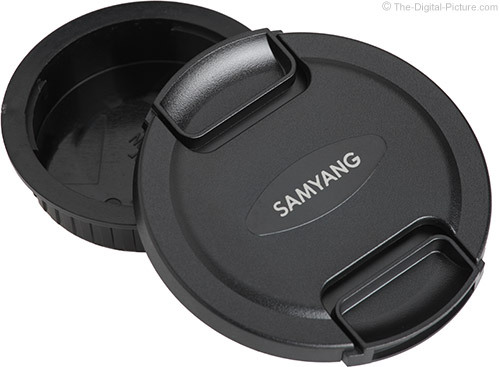 While Samyang provides a mount alignment mark under the rear cap, I would appreciate this mark being visible from the side of the lens or visible when the cap is on. This lens has a modest size and weight. The which lenses to compare it to question is, as already mentioned, not easy to answer. I'll again provide the two APS-C lenses that seem to get closest to the 16mm and f/2 combination in this comparison chart. 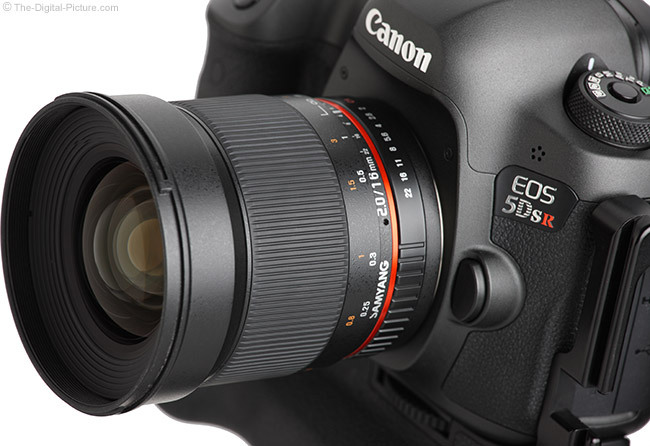 For many more comparisons, review the complete Samyang 16mm f/2 Lens Specifications using the site's Lens Spec tool. 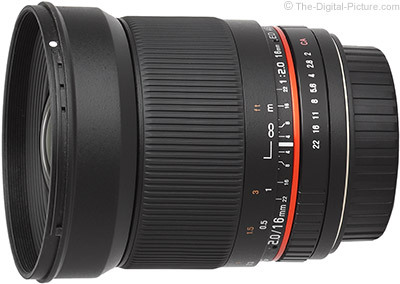 Use the site's product image comparison tool to visually compare the Samyang 16mm f/2 Lens to other lenses. 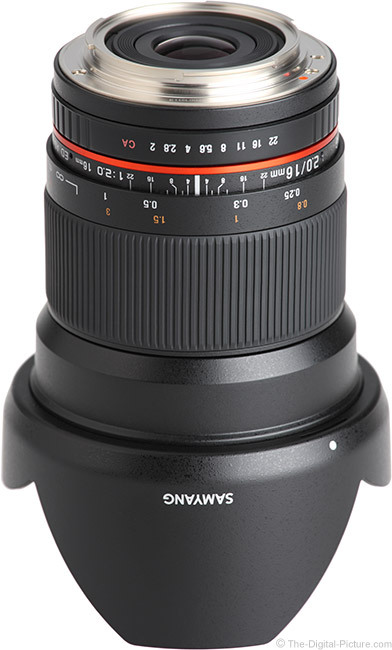 The Samyang 16mm f/2 Lens utilizes the ultra-popular 77mm filter size. While not small, these filters are frequently able to be shared with other lenses in the kit if necessary. On wider angle lenses, we test to see if standard-thickness filter rings cause mechanical vignetting by physically obstructing light. On this lens, standard thickness circular polarizer filter rings do cause some slight additional vignetting, but ... probably not enough to warrant a new filter purchase if one of these is already in your kit. If purchasing a circular polarizer for this lens, the B+W XS-Pro would be an excellent choice. Every Samyang lens I've used so far has come with the lens hood included. 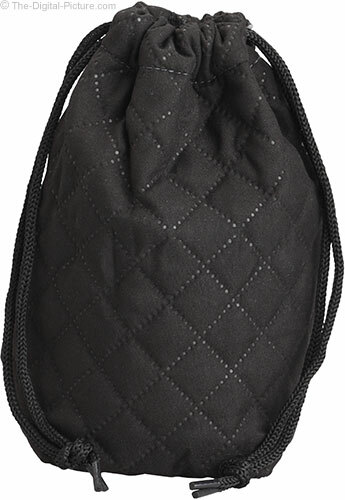 This deeply petaled, matte-finished inside and out, plastic lens hood has some modest flex, but it seems very durable and provides significant protection to the front element, including from light, impact, finger prints, etc. The through-the-lens effectiveness of this hood's shape can be seen in the full frame with hood example in the vignetting discussion. It looks very good to me. FYI: Squeeze this hood in the wrong locations and ... it will not twist off. Samyang includes a simple lens pouch in the box. If there is one thing that Samyang is renowned for, that is low price. You often get what you pay for and that wisdom holds, in some respects, for the Samyang lenses in general. Much of what you are not paying for with this lens are features, including autofocus, autoexposure, auto-aperture, image stabilization and a zoom range. If your needs do not require these features, Samyang's lenses are worth considering as they lighten your wallet much less than many other options. 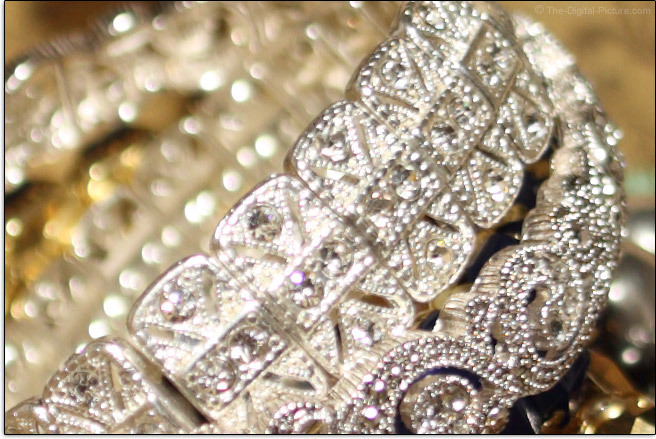 Image quality is, in general, not heavily sacrificed to hit the low budget price tags. 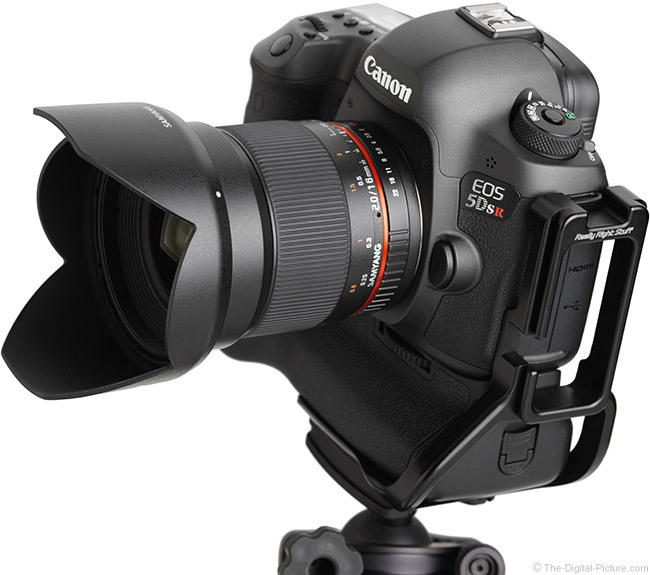 What I'm saying is that the Samyang 16 f/2 is a good value for what you get. The Samyang 16mm f/2 Lens is available in Canon (reviewed), Nikon, Sony/Minolta and Pentax K mounts along with versions for Canon EF-M, Fujifilm X, Samsung NX and Four Thirds mounts. I always include a disclaimer in third party lens reviews, explaining that there are potential compatibility issues with these, typically involving a new camera and an older lens. However, the risk of incompatibilities between a fully manual lens and a DSLR is very minimal. I see this risk being very low. Samyang warrants this lens for 1 year. 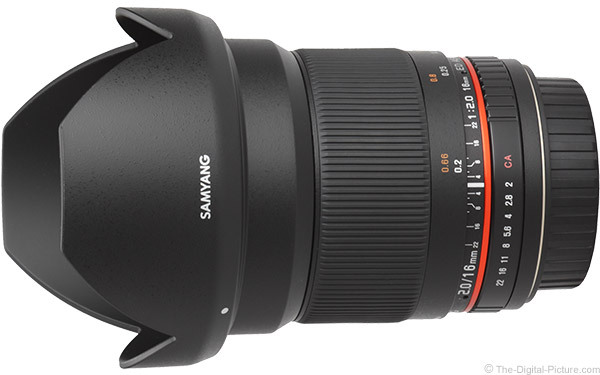 The evaluated Samyang 16mm f/2 Lens was sourced online/retail. There are no other 16mm f/2 prime lenses available as of review time. 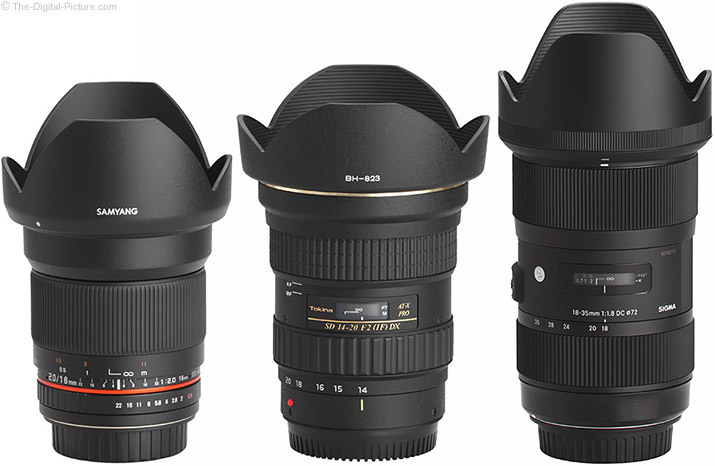 But, Tokina remarkably covers these specs in their 14-20mm f/2 AT-X Pro DX Zoom Lens. While the Tokina is sharper in the center of the frame at f/2, the Samyang delivers much sharper corners. The Tokina shows less distortion and noticeably less vignetting. The comparison is much closer at f/5.6. Valuable to many will be the autofocus feature found in the Tokina lens. The Samyang is smaller, lighter and, important to many, is priced well under 1/2 the price of the Tokina. 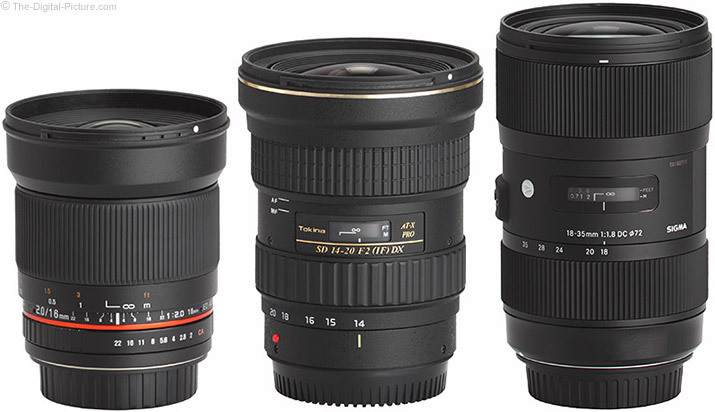 If you can give up 2mm in focal length, the Sigma 18-35mm f/1.8 DC HSM Art Lens is worth considering. This lens has a 1/3 stop wider aperture opening, a nice zoom range and autofocus. These two lenses are not too dissimilar at f/2, keeping in mind that different focal lengths and cameras are being compared here. The Sigma shows noticeably less vignetting. The Samyang lens is smaller and lighter, and your wallet will remain heavier after purchasing it. 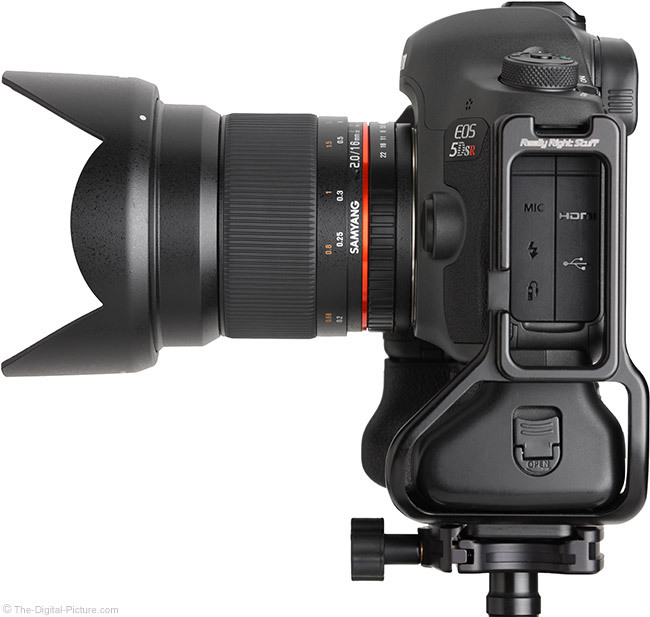 The Sigma is roughly 2x higher priced than the Samyang (and it is much better looking). In conclusion, we have once again taken a hard look a Samyang lens and determined that it delivers quite good image quality for a low price. And, as usual for these lenses, there are features lacking, including autofocus. If you don't mind setting up your camera manually (and your situation permits it), this lens is quite inviting from a price perspective. With a very useful wide angle focal length and an ultra-wide aperture, the Samyang 16mm f/2 Lens will make a nice addition to many kits.